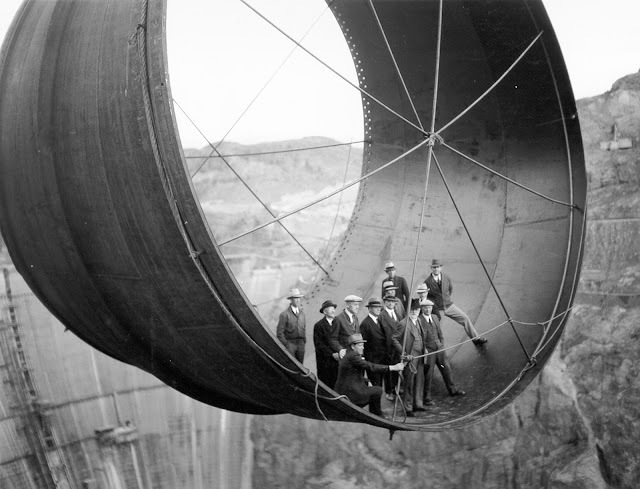 Men stand in a 45 ton steel pipe over the Hoover Dam. Conveying the officials in the photograph is a section of 30ft diameter steel penstock of the soon-to-be-completed Hoover Dam. In the same year, the pouring of the project’s concrete had concluded – a total of 3.25million cubic yards. As the United States developed the Southwest, the Colorado River was seen as a potential source of irrigation water. In 1928, the U.S. Congress authorized the Boulder Canyon Project, later known as Hoover Dam. The reservoir that formed behind the dam is Lake Mead, one of the world’s largest artificially created bodies of water. It covers an area of 603 square kilometers (233 square miles), and its shoreline measures 885 kilometers (550 miles). The hydroelectric generators of Hoover Dam—capable of supplying nearly 1.5 million kilowatts of power—provide electricity to Arizona, southern California, and Nevada. The first difficult step of construction involved blasting the canyon walls to create four diversion tunnels for the water. Facing strict time deadlines, workers toiled in 140-degree tunnels choked with carbon monoxide and dust, conditions that prompted a six-day strike in August 1931. When two of the tunnels were complete, the excavated rock was used to form a temporary coffer dam that successfully rechanneled the river’s path in November 1932. The second step of involved the clearing of the walls that would contain the dam. Suspended from heights of up to 800 feet above the canyon floor, high scalers wielded 44-pound jackhammers and metal poles to knock loose material, a treacherous task that resulted in casualties from falling workers, equipment and rocks. As the dam rose, block by block, from the canyon floor, the visual renderings of architect Gordon Kaufmann took form. Electing to emphasize the imposing mass of the structure, Kaufmann kept the smooth, curved face free of adornment. The powerplant was given a futuristic touch with horizontal aluminum fins for windows, while its interior was designed to pay homage to Native American cultures. There were 112 deaths associated with the construction of the dam. The first was J. G. Tierney, a surveyor who drowned on December 20, 1922, while looking for an ideal spot for the dam. Ninety-six of the deaths occurred during construction at the site. The dam was designated a National Historic Landmark in 1985 and one of America’s Seven Modern Civil Engineering Wonders in 1994. It receives some 7 million visitors annually, while Lake Mead, the world’s largest reservoir, hosts another 10 million as a popular recreation area. Approximately 5 million barrels of cement and 45 million pounds of reinforcement steel had gone into what was then the tallest dam in the world, its 6.6 million tons of concrete enough to pave a road from San Francisco to New York City. Altogether, some 21,000 workers contributed to its construction. The first use of “hard hats” came about during construction of the Hoover Dam. The high scalers took to covering cloth hats in tar. When the material hardened it could deflect falling objects to such an extent that the dam’s construction company ordered commercial production of the hats. The early versions were called “hard-boiled hats”–later known as “hard hats”.